Visit the new Middle East Galleries. What’s underway at the Museum? The Harrison Auditorium is closed for renovations to this historic and much-used space. The Auditorium will reopen in Fall 2019. Watch the removal of the Auditorium’s Art Deco seats for restoration. We are working on creating new galleries for our renowned collections from Egypt and Nubia. The Egypt (Sphinx) Gallery is now closed for conservation of monumental objects, but the Egypt (Mummies) Gallery remains open. In addition, you can see over 120 objects from the Egyptian Collections, many of which have not been on display previously, in the 6,000-square-foot exhibition Ancient Egypt: From Discovery to Display. The Mexico & Central America Gallery and Africa Galleries are now closed for a year of renovations. We are reimagining these important galleries, adding new flooring, cases, lighting, and air-conditioning, and creating dynamic new displays. Both galleries will reopen in Fall 2019. Sneak a peek at our Building Transformation! 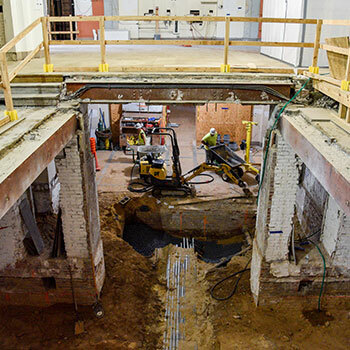 Behind the construction wall in the Main Entrance, the main staircase has been removed (creating space for a new gallery) and our construction team is working on renovating the Harrison Lobby and restrooms below. 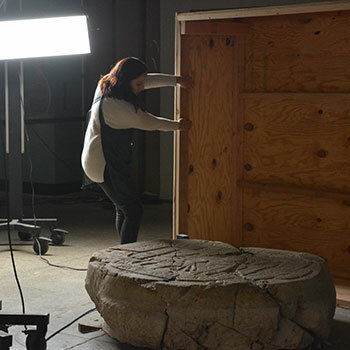 All artifacts have been removed from the Mexico & Central America Gallery except the monumental objects that will remain during renovations, shown being carefully boxed to protect them. 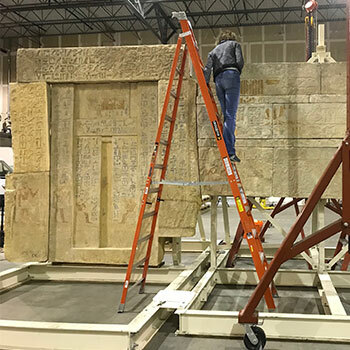 Monumental objects from the Egyptian collection are being moved to an off - site storage facility with space and specialized equipment for conservators to prepare them for display in the new Egypt & Nubia Galleries. Stone monuments from Belize depicting powerful kings. Glimmering gold pendants from Costa Rica. Colorful textiles from Guatemala. The Penn Museum's spectacular collection of art and artifacts from Mexico, Guatemala, Belize, El Salvador, Honduras, Nicaragua, Panama, and Costa Rica across 3,000 years will be showcased in a new gallery that celebrates craftsmanship and culture. The Mexico & Central America Gallery will also explore the Museum's long history of archaeological excavations in the region—uncovering temples, tombs, royal residences, and more—and its groundbreaking discoveries in deciphering hieroglyphics. Ashanti gold beads. Elaborate Kuba textiles. Intricately carved ivories of the Benin kingdom. Dramatic Sherbro masks from Sierra Leone. The Penn Museum's African collection is among the largest in the United States. The new Africa Galleries will feature this spectacular collection in spaces renovated and redesigned for all audiences to enjoy. New interpretive displays will engage all visitors, from children to adults, novices to experts. Objects will trace stories across centuries of Africa's great kingdoms and rich, diverse cultures. The galleries will challenge the antiquated view of the "dark continent" by presenting Africa's continental and international connections, creating new narratives by highlighting Africa's own culture and its place in the world. Our Main Entrance Hall will be completely transformed as we open up staircases and windows that have been sealed for decades, and create new gallery space that will be visible as soon as you set foot inside. The walls and doors separating the Hall from the original 1899 grand staircases on either side of it will be removed, re-opening beautiful arched windows and restoring the marble staircases that provide easy access to the Harrison Auditorium. The Gateway to Egypt leads from the Main Entrance Hall to the Coxe (Egyptian) Wing. Currently dark, narrow, and inaccessible to wheelchairs and strollers, the Gateway will be widened and filled with light by replacing walls with floor-to-ceiling windows overlooking the inner courtyard garden. An architectural masterpiece, the 614-seat domed Harrison Auditorium is one of the largest on Penn's campus and one of the most-used public spaces in the Museum. Upgrades will focus on accessibility and visitor comfort. We will transform the Auditorium with air conditioning, new lighting, new flooring, and enhanced sound and audio-visual systems. The beautiful 1940s seats will be completely refurbished— and are available for naming. The 4,500-year-old crowning jewelry of a Mesopotamian queen. One of the world’s oldest wine vessels. A baby’s rattle. A school child’s first writing primer. A workman’s tool. Through these fascinating objects and over 1,200 more, the Penn Museum’s new Middle East Galleries take you on a journey, exploring how ancient Mesopotamian societies gave rise to the world’s first cities—cities not so very different, in many ways, from our own.